If your goal is to be able to enjoy your outdoor living space while balancing your budget, our Mosquito Treatment is for you. We zap all mosquitos on site and distribute several types of granules to push them and their disease far away from your property. Aside from our fully automated system, which is continuously working and provides a mosquito free yard 24/7, this is the best treatment available on the market. First, we use a backpack sprayer for a wet application to focus on adult mosquitos throughout your yard and brush – kind of like ninjas, sneaking up on the prey. The backpack sprayer penetrates through thick brush, ivy, pinestraw, etc. where a pump sprayer or spray rig are not as effective (a.k.a… everyone else). It has a great deal of pressure and gets into all the areas where mosquitos live and breed. We also use a special eco-friendly formulation that only Mosquito Militia uses to provide the best flushing, knockdown, and kill, because that is really what you want anyway. The second layer is a mosquito repellent granule. We spread this all natural granule across the perimeter of the yard and any focused areas where you might spend time in the yard – go ahead and invite us over if you like and we can zero in on this 100%. 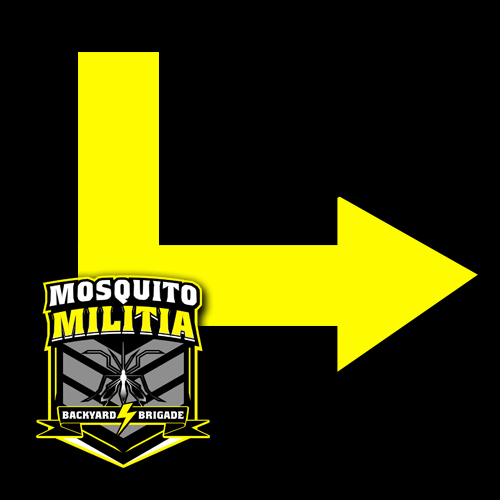 The product we spread throughout the yard is manufactured specifically for our use and is exclusive to Mosquito Militia. Last, but not least, we do a standing water treatment where we put a larvacide to get mosquito eggs to burst into the sunset. Standing water can occur just about anywhere – low lying spots in the lawn, near HVAC units, birdbaths, flower pots, drains, etc. You have to be a detective to work in this job.